The waters which wash Russia’s eastern borders have long become the main reason for the great powers’ conflict of interests. Longstanding collision over Kuril Islands, abundant natural recourses of the Sea of Okhotsk, Kuril coastal waters, Sakhalin and Kamchatka, trade routes linking Asian and American coasts of the Pacific Ocean, nuclear deterrence, America’s anti-missile defence system and other factors have made the Pacific Ocean one of the key elements of the future international politics. It is the Pacific Ocean Fleet that protects Russia’s interests at this boundless theatre. It was not until late XIXth century that the history of the Pacific Fleet as a regular unit began; however, Russian sailors had sailed the Pacific waters long before. Between the XVII-th and XVIII-th centuries the first settlements founded by Cossacks-explorers and seafarers emerged on the coasts of Kamchatka and Okhotsk. The Great Northern Expedition led by Bering and other voyages of the eighteenth century gave Russia and the rest of the world the exact cartography of the northern part of the Pacific Ocean. The development of the biological recourses of that region, namely, sea animals, fish, whales started. Back in those days, the Far East was basically disconnected with Russia, while the lands of Primorye did not even belonged to us – the present-day border along Amur and Ussuri was approved as late as 1860. On 20 June, 1860, off the Zolotoy Rog, the city and port of Vladivostok, the future capital of Russian Primorye, was founded. The warships stationed in the city immediately became the main instrument of the Russian politics in the region. 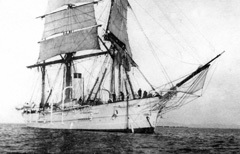 In 1863, a squadron formed of six units under command of Rear-Admiral Popov left Vladivostok to head for San Francisco. Simultaneously, the Baltic Sea squadron under Rear-Admiral Lesovsky arrived in New York which was considered a weighty argument in supporting the Northern States in the Civil war. The Russian ships in the Pacific and Atlantic Oceans were one of the main factors which prevented England’s intervention in the war supporting the South. Vladivostok was chosen the official capital of Primorye and the Fleet in 1871 when the governor’s residence and the main Siberian military flotilla base were transferred to the city from Nikolayevsk-on-Amur. In 1880, a regular service between Odessa and Vladivostok was established. It took 46 days to cross the two oceans. And, finally, the Trans-Siberian Railway, which was opened in 1903, linked the city and the base to Central Russia. In the late XIXth century, the western coast of the Pacific Ocean became the scene for military confrontation between Russia and Japan. Once friendly relationships between the two countries which allowed the Russian Pacific Ocean squadron to station in winter in ice-free Nagasaki came to an end. Consolidation of Russia’s positions in Primorye and Manchuria as well as an increase in activity jeopardized Japan’s expanding interests. The war of 1904-1905 in which Japan was supported by England both financially and technically was lost by Russia due to a number of reasons the main of which were Russian command staff’ incompetence and remoteness of the theatre of war from the leading industrial regions of the country. In the waters of the Far East the Russian Fleet suffered the most crushing defeat in its entire history, namely, the defeat in the Battle of Tsushima. This war is engraved in our memory by immortal feats of the cruiser Varyag, destroyer Stereguschiy (“On Guard”), coast-defence battleship Admiral Ushakov which died in battles with the greatly-outnumbered enemy. After the utter defeat in the Russian-Japanese war, Russian naval forces in the Far East were reduced to almost to zero. The Pacific Ocean Fleet was re-formed in the Siberian flotilla aimed at coastal defence. The revival and restoration of Primorye’ naval forces began after the Revolution and Civil war, in the 1930s. On 11 January, 1935, the Far East’s naval forces were granted the Fleet status. The first Commander of the Soviet Pacific Ocean Fleet was Flag officer Mikhail Viktorov. In the 1930s, the Pacific Ocean Fleet’s forces were involved in local conflicts: naval aviation was engaged in air warfare against Japanese airplanes during the battles at Lake Khasan and Khalkin-Gol River. The fleet did not take part in the Great Patriotic War; however, Pacific submarine and destroyer units were transferred to the north to participate in battles there. The fleet’s key mission was to protect the USSR frontiers and its lines of communication in the Far East in case of war with Japan. In the summer of 1945, the Pacific Ocean Fleet together with the Siberian flotilla were active in naval operations against the Japanese forces. The fleet ships landed troops in the southern part of Sakhalin and Kuril Islands. 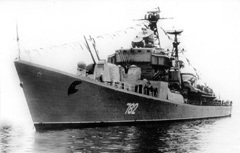 During the post-war years the Pacific Fleet kept fulfilling defensive missions – the USSR was inferior to its rivals in the Cold War in terms of naval power. The Fleet’s capabilities significantly increased after it was armed with new light cruisers of project 86bis, destroyers of project 30bis and 56 as well as modern diesel submarines of projects 611 and 613. These new tactical units allowed the fleet to “break away from the coast” and enter the ocean. After the Pacific Fleet was equipped with atomic-powered submarines the established basing system was to be considerably modified. Atomic-powered vessels which needed a free access to the maneuver space with no narrow waters to be able to fulfill the mission were given a base in Petropavlovsk-Kamchatsky. From mid-1960s to late 1980s, the USSR Pacific Ocean Fleet was responsible for various missions. The most important among them were the following ones: active duty of strategic missile-carrying submarines being prepared to deliver nuclear attacks; tracking aircraft-carrying groups and atomic-powered submarines of the “possible enemy” and securing the USSR presence in the Indian Ocean where the USSR Navy’s 8th strategic squadron performed its duties. Apart from the above-mentioned, having the most powerful marines groups available compared with other Soviet fleets, the Pacific Fleet was to provide, if needed, the landing of the Soviet troops on the Japanese islands. Like the other Russian fleets, the Pacific Ocean Fleet sustained heavy losses during the post-Soviet years. Russia’s regular presence in the Indian Ocean ended. Moreover, the Fleet had to withdraw from its base in Kamran, Vietnam. The number of fleet’s ships reduced two times. Surface ships of 1st and 2nd rank are still based in Vladivostok. The Pacific Ocean Fleet’s flagship is the missile-carrying cruiser Varyag of project 1164. In addition, the fleet has a heavy atomic-powered missile-carrying cruiser Admiral Lazarev but it is on temporary conservation nowadays. On the whole, the bulk of the Pacific Fleet’s large surface ships are large anti-submarine ships and destroyers. The Fleet is equipped with four anti-submarine ships of project 1155 such as the Admiral Tributs, the Marshal Shaposhnikov, the Admiral Vinogradov, and the Admiral Panteleev. These tactical units are being frequently and efficiently used representing Russia in long cruises. There are also four destroyers of project 956 (Boyevoy/Fighting, Burny/Stormy, Bystry/Fast and Bezboyaznenny/Fearless) in the Pacific Ocean Fleet. Unfortunately, due to a heavy tear-and-wear of Kharkov-made boiler-and-turbine power installations, these fast and heavily-armed battleships are out of order at present. At present, the fleet has one large surface ships formation and four large anti-submarine ships available. 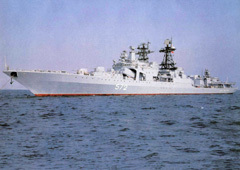 This formation is equipped with a powerful anti-aircraft defence and perfect impact capacities (the cruiser Varyag carries 16 heavy supersonic anti-ship missiles Vulkan of 700-km range each of which is capable of destroying a ship of cruiser class and inflict substantial damage to enemy aircraft-carriers). Anti-ship systems are also very effective in terms of destructive capabilities; however, given such an extended theatre of war, one formation is not enough. For the fleet to operate efficiently, it is vitally important to put into service Admiral Lazarev and four destroyers which will allow forming two striking-anti-ship formations. The “mosquito fleet” is represented in the Pacific Ocean by four small-size missile-carrying ships of project 12341 and eleven missile boats 12411. They are united into three missile boats divisions intended for conducting operations in the Sea of Japan and narrow waters of Sakhalin and Kuril Islands. The protection of the waters near the Fleet’s bases is the primary duty of eight small-size anti-submarine ships of project 1124M and ten minesweepers. Besides, the Pacific Ocean Fleet’s marines have five large landing ships. The main striking force of Russia in the Pacific Ocean is her underwater fleet. The fleet is equipped with all known classes of submarines. It has four strategic missile-carrying underwater cruisers of project 667BDR such as K-506 Zelenograd, K-211 Petropavlovsk-Kamchatsky, K-223 Podolsk, and K-433 Saint George the Victorious. Each of these underwater cruisers carries 16 intercontinental ballistic missiles with multiple warheads. These Pacific Fleet’s strategic missile-carrying underwater cruisers serve in the Sea of Okhotsk. The Fleet’s anti-aircraft forces are presented by five atomic-powered missile underwater cruisers of project 949A, namely, K-132 Irkutsk, K-119 Voronezh, K-442 Chelyabinsk, K-186 Omsk, and K-150 Tomsk. These submarines, sister ships to the Northern Fleet’s Kursk that died in 2001, are intended for enemy large surface ships groups destruction and each of them carries 24 heavy anti-ship missiles Granite. 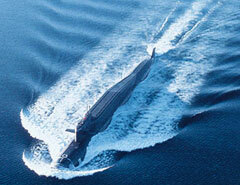 The group of Pacific Ocean Fleet’s multi-purpose submarines consists of six submarines of project 971. K-263 Barnaul, K-322 Kasatka/Killer Whale, K-391 Bratsk, K-331 Magadan, K-419 Kuzbas, and K-295 Samara are among the latest versatile submarines of the Russian Navy. Unfortunately, we do not have any proved data concerning the current state of that group but, according to reliable sources of information, from 3 to 5 submarines of project 971 can enter the sea any time. These submarines are used, first of all, for chasing USN atomic-powered underwater missile carriers which are on duty in the eastern part of the Pacific Ocean. The Fleet can also boast of eight diesel submarines of project 871. Based in Vladivostok and Petropavlovsk-Kamchatski, these subs are intended, first and foremost, for protecting the straits leading to the Sea of Okhotsk from both Japanese and American submarines. A rather mighty shore-based aircraft unit including supersonic missile-carriers Tu-22MZ is based in the Far East. Moreover, strategic Tu-22MZs for use mainly against sea-based targets are also based at aerodrome Vozdvizhenka in Primorye. On the whole, the present-day state of the Pacific Ocean fleet leaves much to be desired. Available personnel are insufficient for efficiently exercising control over the theatre of war, not to mention securing Russia’s supremacy at sea. The ships group in the Sea of Japan is considerably inferior to that of Japanese naval forces which have state-of-art destroyers of AEGIS class available. The Fleet’s underwater forces also cause concern. Nowadays, the Pacific Ocean Fleet fails to secure its presence in a number of strategically important sectors. There is quite a large ships group of frontier troops’ naval units but their capabilities and the range of tasks they can fulfill are very much limited since they are responsible for conducting guard duty in the region of Sakhalin and Kuril Islands. However, the presence of a large group of supersonic long-range missile carriers in the Far East introduces some balance in the situation. But we all can not but understand that for the Fleet to be able to accomplish its missions in the most efficient way substantial sums of money should be allocated on repairing out-dated ships and putting new ones into service. Failure to do that will lead to a critical situation when in case of a more or less serious military conflict the missile-carrying cruiser Varyag might have to repeat the deed of its legendary predecessor.